Synopsis of Cook Like A. Champion TV Series: Thank you for the opportunity to share my vision and dream with you! 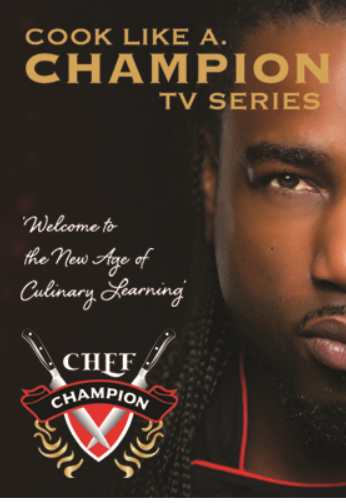 My name is Chef Ace Champion, and I’m the owner and executive producer of Champions Production which produces the TV hit Cook Like A. Champion TV series which I also host. This is a cooking show like no other! What separates Cook Like A. Champion from other TV cooking shows is my signature Infusion Style of Cooking, combining cultures and flavors from all over the world. Chef Ace Champion is bringing a new level of teaching you the real way to cook. Emerge your culinary senses in his upcoming food experience on the hit show “Cook Like A. Champion.” Learn the tricks of the trade in one-on-one detailed cooking classes. Before no time you to will be Cooking Like A. Champion! What you’ll love about Cook Like A. Champion is this master chef’s delectable infusion style of cooking that intricately combines cultures and flavors from allWatch today on over 100 OTT Platforms! BINGE Networks is a streaming media platform that helps content creators monetize their content, and get instant distribution on Smart TV outlets and OTT all over the world! Their patented distribution technology allows creators to upload videos, and have instant syndication on over 100 platforms! Listen to the latest food trends on Cook Like A. Champion Podcast. Topics including holiday favorites, food trends and full individual recipes. Listen Now!